Inflammation is a common thread in both gum disease and heart disease. Does this mean that gum disease can cause heart disease? The jury is still out o the findings, but it is known that the progression of plaque building up in arteries is similar to the inflammation in gums caused by plaque on the teeth. Many researchers say that poor oral health does not cause heart attacks. Other researchers, according to the Academy of General Dentistry, indicate that the mouth, or pathway to the body, is the key indicator to the overall health condition of the body. These researchers have suggested that the bacteria present in the mouth, from gum disease, can enter the body and attach to blood vessels causing the perfect storm for blood clots by raising blood pressure. Clots restrict the blood flow to and from the heart and can lead to disastrous results. Is Good Oral Health the only Key to a Healthy Heart? Good oral health is one important factor to a healthy heart. Proper diet and daily exercise and overall good care of your entire body work hand in hand with good oral health. Flossing after meals and brushing your teeth twice daily is the minimum recommendation for good oral health. Risks for heart disease can be increased by smoking, poor nutrition and leading a sedentary lifestyle. This February, take action to get a thorough dental exam with top New Jersey dentist Dr. Ron Rotem. For the absolute best in dental care, you don’t have to drive to New York City when you have a professional like Dr. Rotem available in Ocean County. Trust your oral health to Dr. Rotem. He has been caring for Ocean County residents for nearly 20 years and continues his education annually to bring you the best in modern dentistry. 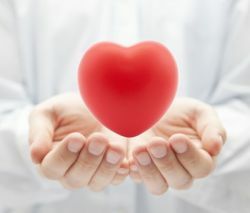 Be good to your heart beginning with good oral health. Don’t gamble on the chance of the link between poor oral health and poor heart health. Make a commitment to yourself and those who love you by starting your heart-healthy lifestyle with a thorough oral checkup with Dr. Ron Rotem for National Heart Health Month.